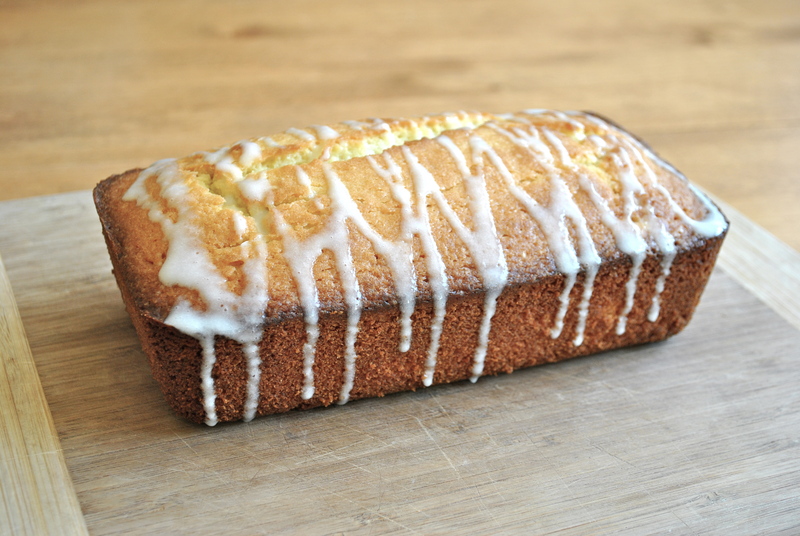 * I recommend using a glass loaf pan for this recipe. Glass takes longer to heat up, but it heats evenly and it maintains even heat as the oven cycles on and off. 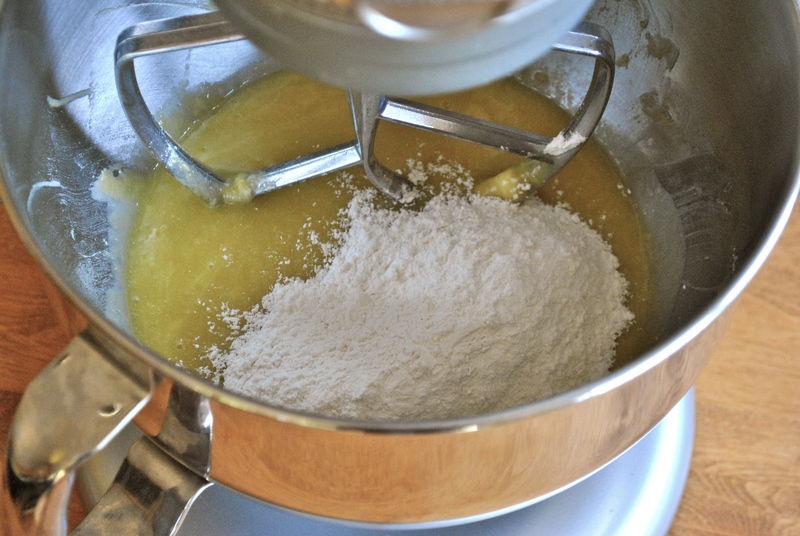 When baking in a glass pan, baking time is 5-15 minutes longer than if using a metal pan. You can substitute a metal loaf pan if that’s what you have on hand, but remember that the baking time will be much shorter. to lightly grease your loaf pan. 3. 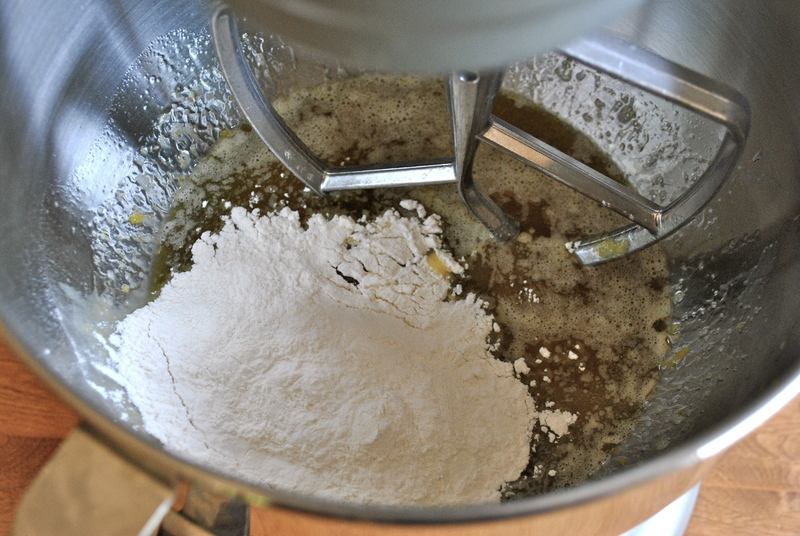 Sift the flour, baking powder and salt together and set aside. just sprinkle the salt evenly over the sifted flour and baking soda. start to look a little funny, almost like custard. low until combined; scraping the sides of the bowl as needed. Do not over mix. 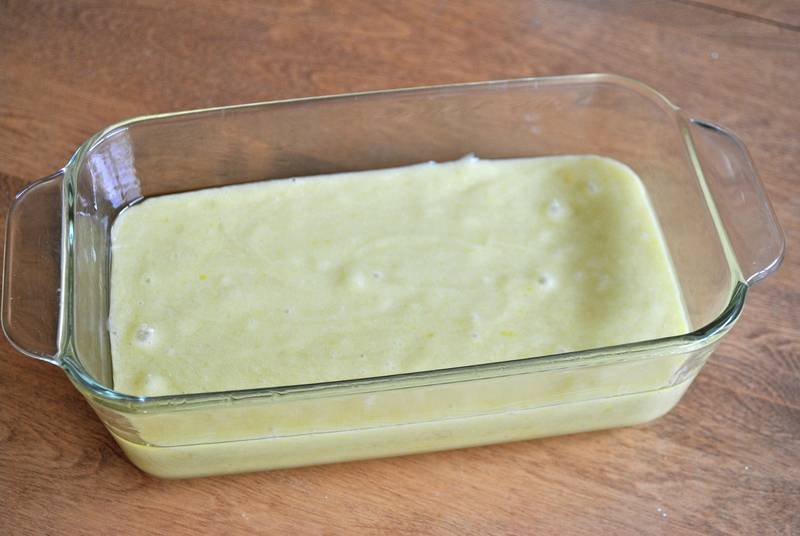 The batter will look very much like custard at this stage. a toothpick inserted into the center comes out clean. 6. Cool in the pan for 10 to 15 minutes. You do this because there is a good chance that your cake will break apart if you try to remove it from a hot pan. to finish cooling and glaze if desired. This may take a little patience. 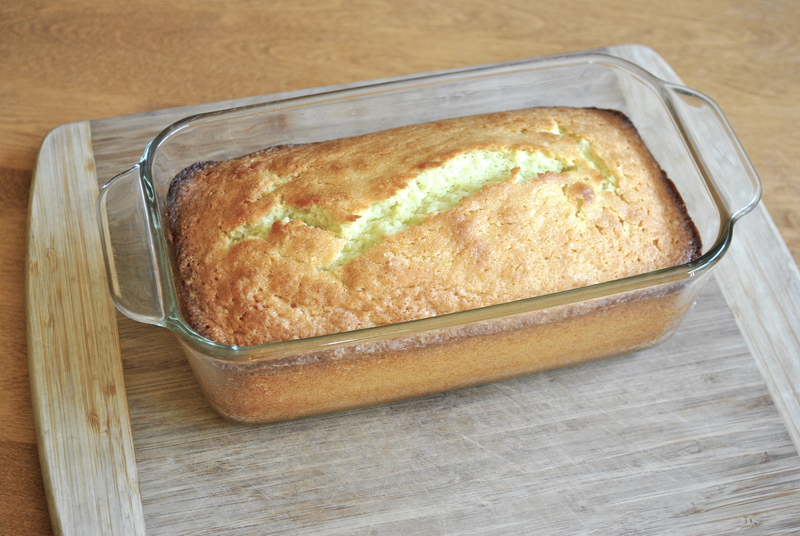 I usually run a table knife (some people call it a butter knife) along the edges of my glass pan to loosen the cake. Do not do this if you are using a non-stick pan because you could scratch the pan and ruin the non-stick finish. 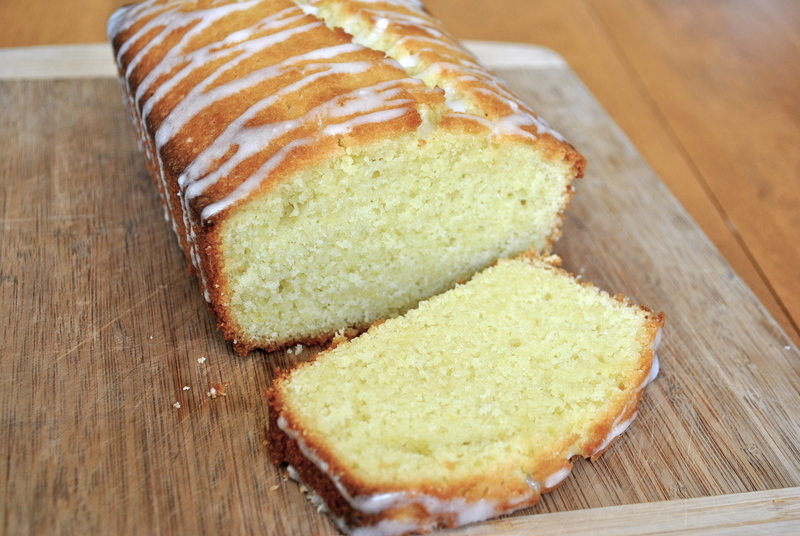 Do not allow the cake to finish cooling on a cutting board or a plate because condensation will build up under the cake and result in a soggy bottom. Note: This recipe can be doubled to use in a bundt pan! If doing so, make sure you grease all of the nooks and crannies of the bundt pan well and lightly dust the pan with flour or you will not be able to coax the cake out of the pan without breaking it. This entry was posted in Cooking, Sweets and tagged cake, dessert, recipe, science. Bookmark the permalink. Congrats on creating your own recipe. I’ll certainly give it a try. The photos are great! Thank you very much! This was a huge step for me so I’m pretty darn excited! Looks and sounds yummy . . . I may try it today. Good job Jamie!